Calming, neutral expanses of grey, taupe and ivory walls go well with many different accent colors and decorating styles and have been the trend for several years now. But for those of you contemplating an interior painting spree, there are some solid reasons to consider having your painter roll some more vibrant colors onto your walls. It is an established fact that certain colors evoke specific moods. There is some literal truth to the phrases black mood and seeing red. If someone in the family needs a little help to see the sunny side of life, take a look at a soft, buttery yellow, or try a fresh sage or celery green to encourage balance and healing. Mix it up and put the two together for a sense of overall well-being. Choose colors for your interior painting that will bring life and joy to your family members. A kitchen that is painted in vibrant reds brings energy to the table and stimulates appetites. Orange tones encourage creativity and invite sociality. Combining the two shades may help your family meals and entertaining feel more satisfying and enjoyable. Someone who experiences difficulty sleeping, on the other hand, would not benefit from painting the bedroom red. Rather choose calming, soft tones of sky blue, aqua or pale turquoise. These are the colors many spas use to help clients relax. Avoid using too strong a tint – the idea is to create a calming and relaxing oasis where sleep comes more easily. Choosing your colors is just the beginning. Interior painting takes proper preparation to ensure that walls are smooth, blemish free and ready to show off those impressive new colors at their best. 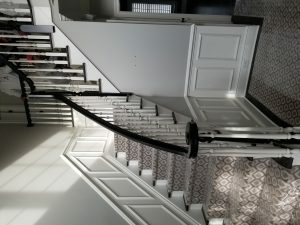 Hire licensed professional painters to do the dirty work of getting the walls ready and use proper rolling techniques to ensure crisp edges and an even finish. Your walls will be the perfect background to show off your new style.